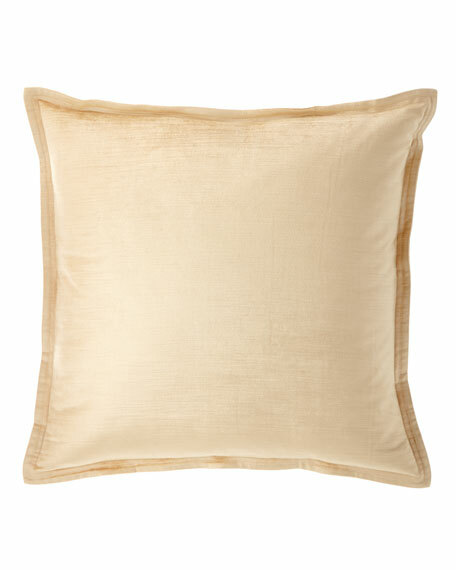 Your decor will have a golden moment with Donna Karan's Vapor velvet decorative pillow. Swathed in rich, soft-to-the-touch velvet, this pillow elevates a bed's look and feel. Handcrafted velvet pillow with metallic floral pattern. Cover, polyester. Down/feather insert. 24"Sq. Dry clean. Made in the USA of imported materials. EXCLUSIVELY AT NEIMAN MARCUS Handcrafted pillow in diamond pattern. Cotton/polyester/rayon. Feather fill included. Hidden zip closure. 20"Sq. Dry clean. Made in the USA of imported materials. Pillow in metallic leopard pattern. Fabric 1: polyester/rayon. Fabric 2: polyester. Dry clean. 18"Sq. Made in the USA of imported materials. EXCLUSIVELY AT NEIMAN MARCUS Diamond patterned pillow. Polyester/cotton. Fill: feather/down. Dry clean. 20"Sq. Made in the USA of imported materials.